Konovalova N. S.Gorbenko M. D.
Bechko P. K.Barabash L. V.Holoborodko Ya. O. Summary. The article studies directions of reforming of the accounting system of remuneration of public sector entities in the application of National provisions of accounting standards to public sector entities and new chart of accounts for budgetary institutions in 2017. 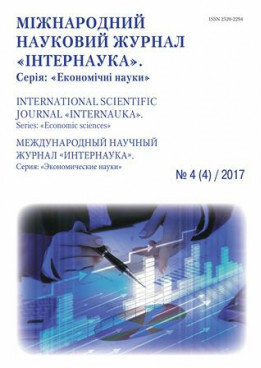 Given the achievements of the leading Ukrainian scientists, the main directions of their research in the field of accounting, which revealed the need for deeper research is the elaboration of accounting policy for accounting of payment. Identified key problems faced by public sector entities in accounting for wage and given the inconsistency of salaries of employees of budgetary institutions to the requirements of European standards. Considered the main regulatory framework governing the research questions and also investigated the main statistical indicators, which confirm the relevance of the article. Key words: public sector, wages, expenses, wage, аccounting, standards, the minimum wage. Kovalenko D. I.Sitnichenko K. I. Summary. The article presents the results of research on the production of new methodological approaches to revenue management system construction of industrial enterprises in a crisis. Based on the specific industry, identified the importance of maintaining high efficiency of revenue management for enterprises. Posted modern classification of income. Posted latest understanding of economic substance and the functional purpose of revenue management systems of industrial enterprises. The features of the organization of revenue management in the economic crisis. The role of income groups in the process of working capital, and on this basis submitted proposals to improve working capital management industrial enterprise. Revenue also considered as a specific financial resources, and on that basis proposed implementation procedures to support effective resource revenue management. Keywords: revenue, profitability, revenue management, economic crisis, industrial plant. Halytska E. V.Primierova O. K.Semikolenova S. V.
Summary: The article is devoted to the 170th anniversary of the birth of a prominent statistician and a public figure of XIX century O.O. Rusov. The article deals with his life, presents his main publications, and describes the results of his research. The historical role of the scientist in the development of theoretical and methodological principles of statistics is discovered. The article describes the contribution to the development of scientific theory and methodology of statistical research, promotion of the use of statistical methods: grouping, generalization (relative and average values), tabular and graphical methods. Particular attention O.O. Russov gave to census, defined methodological and organizational aspects of their implementation, focused on the experience of censuses in foreign countries. In the article attention is focused on the conceptual framework of statistical observations, statistical and economic research programs of economic and social life of the provinces at the time, which were developed by scientist. Key words: O. Rusov, statistics, statistical and economic research, theory and methodology of research.